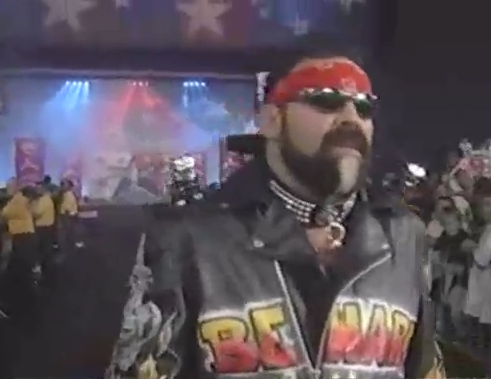 Induction: Sting vs. Rick Steiner: Release the hounds (and whoever spliced this footage together)! - WrestleCrap - The Very Worst of Pro Wrestling! 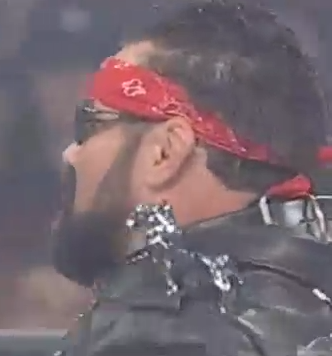 Induction: Sting vs. Rick Steiner: Release the hounds (and whoever spliced this footage together)! Live wrestling audiences tend not appreciate pre-taped matches. Believe it or not, people who pay money to see matches in person hate it when they are subjected to fight sequences in remote locations that they don’t get to see first-hand. Whether it be the King of the Road match, the Hollywood Backlot Brawl (note to self: induct the Hollywood Backlot Brawl), or any other prerecorded match with Dustin Rhodes, fans in arenas don’t like buying tickets to watch action on a screen when they could have stayed home and done the exact same thing. No worries. Everyone in the arena can just watch the Boiler Room Brawl on these TV sets. The AV club just needs them back at school by 8 o’clock tomorrow morning. Now, there are canned matches, and then there’s Great American Bash ’99. At that year’s Bash, Sting would wrestle in a falls-count-anywhere match against Rick Steiner, who had recently re-aligned himself with his brother Scott. The announcers noted that Rick had adapted the style of “Big Poppa Pump,” which was a polite way of saying that he only used punches and kicks. They also noted that the match wouldn’t be for Steiner’s TV Title, which was really for the best, because putting a third-tier title at stake in a major match could only diminish a bout’s luster. Ever wonder why Shawn Michaels didn’t put his European title on the line in the first Hell in a Cell match? I mean, besides The Undertaker never being in the Clique? Bad move-set or not, the Dog-Faced Gremlin at least had a cool ring jacket, to which he had glued two Monopoly pieces on the shoulders. I would have opted for the top hat or the battleship, but to each his own. Sting, on the other hand, arrived with his wet, stringy hair and face paint. This would become more important as the match wore on. 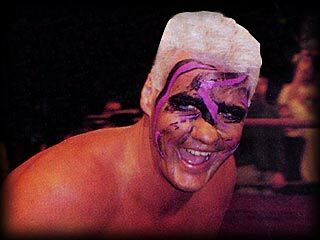 See, as usual, Sting’s paint smudged and smeared throughout the match, even leading Tony Schiavone to note that he had seen Sting wrestle matches so long that he had lost all his makeup by the end. I bet if Tony had seen the ending of this match ahead of time, he wouldn’t have directed the viewer’s attention to Sting’s paint. 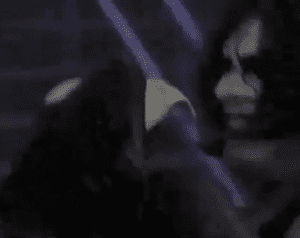 In a horrific scene featuring an impossible number of camera cuts, who should be attacked by vicious dogs but Sting, complete with fresh makeup covering his face! Not only that, but his hair was now dry, full, and fluffy. Women the world over would be dying to know what shampoo the Stinger used to make his hair suddenly so fabulous after a long day at work. Of course, anyone watching could tell that this was not really Steve Borden, but instead a rather carelessly-prepared stunt double. I mean, even Barry Windham smudged his makeup a bit when he impersonated Sting at Halloween Havoc. Still, at least WCW’s wardrobe and makeup people gave this body double the right clothes and color of paint. I can just imagine them outfitting this fake Sting with a blonde crew cut, pink tights, and gaudy early-90s face paint and figuring no one would notice the difference. There were just a few other clues to the audience that this scene was not exactly on the level. 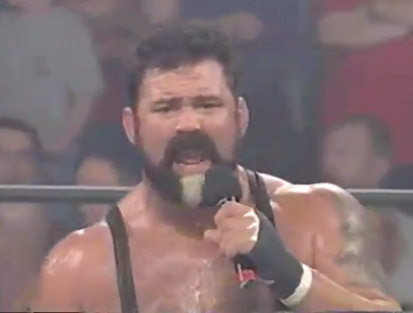 For example, after Tank Abbott choked Sting with a towel, the stunt-double Stinger grabbed the towel as one of the dogs bit his hand. WCW was gracious enough to splice in a few clips of the real Sting, but he all of a sudden had the towel elaborately wrapped around his hand and forearm. That’s another thing: when they filmed this earlier in the day with close-ups of the real Steve Borden, WCW knew well enough to smudge Sting’s makeup to account for the ten-minute match he would wrestle before this footage aired. So why didn’t they do the same for the stunt double? I guess the 400 grand they were paying Master P’s bodyguard cut into their “taking your finger and rubbing off your face paint” budget. There was also clearly some strange physics going on, as well. We’re talking teleportation, here. Normally, to film a sequence like this with so many camera angles, you would need about a half dozen cameramen. 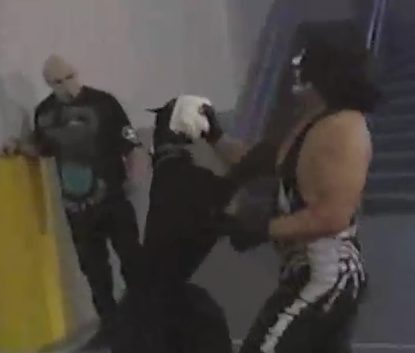 Obviously, since we were expected to believe that this was an impromptu brawl, the only camera man on the scene should have been the one following Sting and Rick through the curtain. I mean, it’s not like WCW would pay to keep an extra camera crew in one particular room backstage all night just in case something interesting happened there. Okay, considering that the company also used to fly out the entire roster to Nitro every week no matter who was actually booked, maybe they would do that. Even so, you would think that with so many cameras in one small area, shooting from so many angles, at least a few of them would have been visible on screen. Not so! Aside from one guy hanging out by the stairs in one of the shots, there is nary a camera in sight. Thus, if fans were to believe that the action was happening live, the only possibility was that a single camera man was constantly teleporting around the room with all his equipment in tow. …but he also managed to run, or rather, walk, faster than the speed of light. As you can see when the one dog is giving Sting a big hug and the other one is feasting on his knee pad, Steiner’s feet are in view on the edge of the screen, only for him to appear at the end of the hall with a Rottweiler in the very next frame. 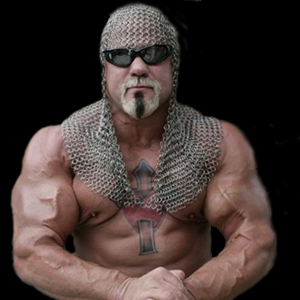 With all this magic being used against Sting, are we completely sure that the Black Scorpion wasn’t the Big Bad Booty Daddy all along? Do you remember, Sting? Sioux City, 1987? Faaaaaat asses? Which raises another question: where was Doug Dillinger’s security team back in 1990 when the Scorpion turned that one guy into a leopard? Surely that forcible species-change was a more pressing security issue than Sting’s playtime with the Steiners’ puppies. Great, now I have the image in my head of the Steiners’ puppies. After that chaotic series of events, the fans in the Baltimore Arena were audibly displeased. 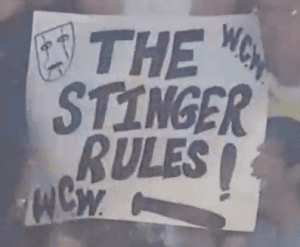 I can only guess it’s because they were really big fans of Sting (Although one fan apparently confused the former world champion with Abe “Knuckleball” Schwartz). The Steiners brought the referee into the ring and coerced him into declaring that Rick had won by pinfall, which obviously didn’t really happen, especially given that the referee had vanished into thin air once Sting and Rick stepped through that curtain backstage. The fans, perturbed at a non-finish involving some of the worst editing ever executed by man, were at least consoled by a never-ending promo by both Steiner brothers. Obviously, working with live animals is risky business, especially on live TV, as the WWF’s Kennel from Hell match would prove later that year (Working with dead animals, on the other hand, is much safer, as the WWF’s Pepper on a Pole match would also prove later that year). For that reason, I totally understand why, if WCW were so gung-ho on ending the match with dogs attacking Sting, they would opt to film it ahead of time. I also feel sorry for everyone involved, since filming clearly took a long time and a lot of takes, only to end up with such an awful final product. …WCW was clearly outmatched. Besides, live animals or no live animals, you’d never see the WWF doing anything so silly and contrived in 1999. …you probably should ignore that. 14 Responses to "Induction: Sting vs. Rick Steiner: Release the hounds (and whoever spliced this footage together)!" At least the dogs didn’t start crapping all over the place. I think this stunt by WCW managed to insult the intelligence of even the 8 year old wrestling fans watching at the time. Do I smell something shitted out by Russo???? Russo was still working in WWF at the time. Someone even more retarded than him thought this crap up. Wait, the Hollywood Backlot Brawl hasn’t been inducted yet? I sure hope somebody gets fired for that blunder. 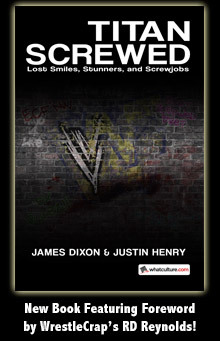 I even made a thread about it on the old Wrestlecrap boards a long time ago about it. INDUCT THAT ASAP! What about the No Limit Soldiers? I believe this was when Nash was booking. 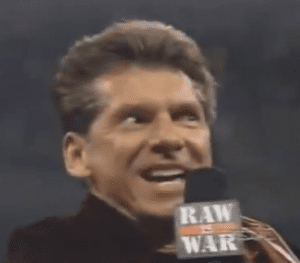 Russo didn’t start in WCW until October 1999. First show Russo & Ferrara scripted was Halloween Havoc 1999. I do have to point out that the dogs used in this match are Oscar-nominated potentials compared to the Razzies dogs used for the infamous Kennel in a Cell match. Has anyone else noticed the number of comment threads that start with “Russo was so dumb” followed by the comment “but Russo worked aomewhere else at the time”…who is this other mystery booker who is apparently even worse?! We need to track him down. Where was Ole Anderson in 1999? I would guess Ole would be hating Dave Meltzer and everyone else in the universe. And just like saying Kevin Nash is lazy, Russo is so stupid just rolls off the tongue so easily. I wonder if the reason this was pre-taped was to avoid something like the disaster with Goldberg earlier that year where he cut himself on glass and almost lost an arm. I have seen snippets of this, but I never knew that it was this bad, lawls!